I normally review traditional bakeries on Thursdays, but Cloverhill is called a "bakery", so I decided it counts. They don't have a storefront though, rather they produce packaged goods, usually sold in vending machines. Vending machine baked goods are not something I'd normally eat, but the really good one from 7-Eleven re-inspired me (although that one wasn't pre-packaged exactly, as they claimed they are baked fresh every morning). Anyway, I learned my lesson. No more packaged baked goods. Meh. This thing is an award winner: "The Big Texas is the 2005, 2006, 2007, 2008 and 2009 Automatic Merchandiser Readers' Choice Pastry of the Year". Potential? No. First, I tried it at room temperature. This cinnamon roll had absolutely nothing going for it. It tasted like kinda stale bread, just with a bit of cinnamon swirled in and cheap icing on top. Not worth even a second bite. However, I was encouraged by the glazed bun from Walgreens, which was clearly a prepackaged item, was also not good at room temperature, but proclaimed I should warm it up, and when I did, it got much better. 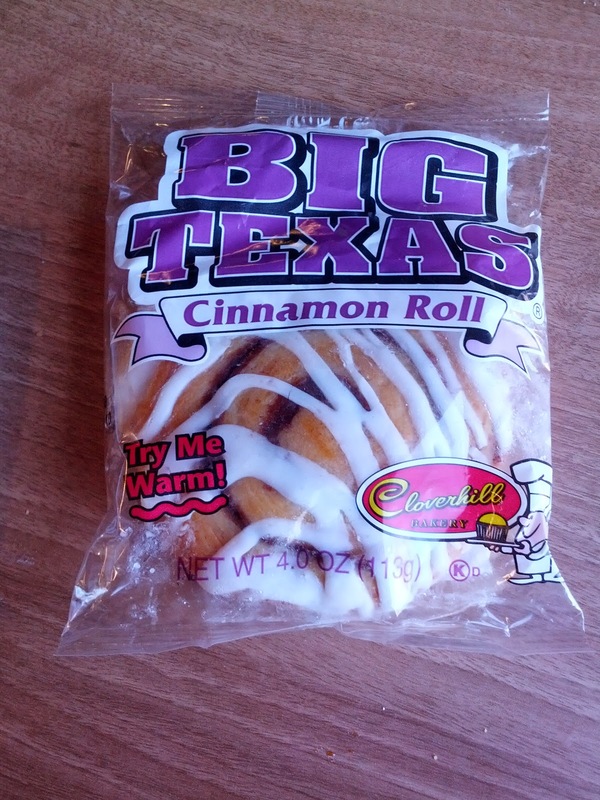 The packaging for the Big Texas Cinnamon Roll said the same thing. So, just like the Walgreens one, I put it in the toaster oven for a few minutes. I've visited Cedar Hill a few times, but alas, they closed a few months ago. This review is a bit delayed. My first visit was inspired by the fact that I had some chili at home and I wanted a side to go along with it. So, doing what I do these days, I pulled out LevelUp, to find somewhere suitable. I quickly found a BBQ place, that seeded LevelUp with a whole $4! I could buy some corn bread with that, which would go perfectly with my chili! Cedar Hill was a cute place, with a few tables outside, a bar area, and some tables inside. It was casual and friendly feeling. I ordered my cornbread togo, which you can do at the bar. It seemed like many people get take out from here. While I waited, I examined their large selection of house made sauces, mostly bbq based, with a huge variety of flavor profiles. I'm not really a bbq person, but if I were, I'd go back to try out their sauces. Perhaps I'd go back just for sides, as I do love all of the things that go along with bbq, like mac and cheese, potato salad, etc. They also run a food truck, The Rib Whip, which I've seen around town but never stopped at. When I went to pay, no one knew how to use LevelUp. Like my snafu at Fresco Pizza and Shwarma, their phone was also unplugged and dead. But, they plugged it in, turned it on, and asked around until they found a cook who knew how to use it. And unlike Fresco Pizza, they apologized and didn't act like I was the worst person ever. On my next visit, the setup had changed somewhat. It appears that everyone now orders at a counter, where the LevelUp phone is nicely installed next to the register. It worked flawlessly on my second visit. The staff were very friendly. When I mentioned how hot out it was, she offered me a plastic cup to fill with water togo, since I was getting my food togo. Very appreciated! Cedar Hill Cornbread : Housemade skillet cornbread with jam & butter. $3.50. The cornbread was served in a big wedge, with butter and sweet pepper jam on the side. 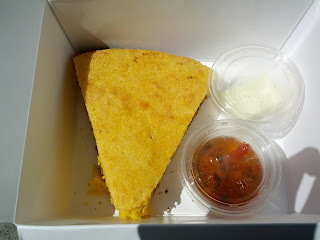 The cornbread had a nice gritty consistency from the cornmeal, but no real chunks of corn. It was fairly moist, with a crisper top layer, and a very crisp bottom from being cooked in a skillet. It was good, but not remarkable. The sweet pepper jam was a nice touch, but I really wished the butter was honey butter! I enjoyed this with my chili, but I would not go out of my way for it otherwise. Small Side of Coleslaw. $4. They offer two varieties of coleslaw, a mayo based version and a vinegar based version. I'm definitely a mayo version gal, but I asked for a recommendation just in case. The person taking my order very promptly said she liked the mayo one best. Good! The slaw was made up of both red and green cabbage, nice and crisp, in assorted size chunks. The cabbage was nicely prepared. There was also a ton of red and green peppers. I've kinda been anti-bell peppers lately, so this was disappointing. There was a lot of it! There was also some red onion. 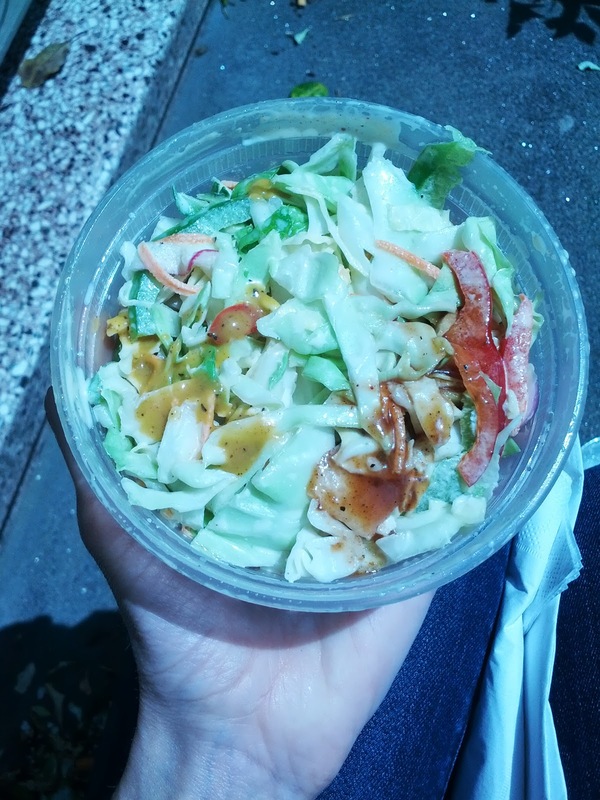 The slaw was only lightly dressed, not all that much mayo, but also, just not much flavor. Incredibly unremarkable. I tried out a couple of their house made bbq sauces, hoping to amp up the flavor a little, but, it still was pretty lacking. A small size was $4, and really not worth it. This was as unremarkable as any grocery store variety, and at least twice as expensive. Would not get again. Langostino Lobster Burrito from Rubio's! Since I've reviewed Rubio's so many times now, I'm going to spare you the intro. It was the same as always friendly staff, fast efficient service. My most recent visit to Rubio's to try the latest limited addition offering, the always exciting Langostino Lobster, available only for a short time every year starting in October. 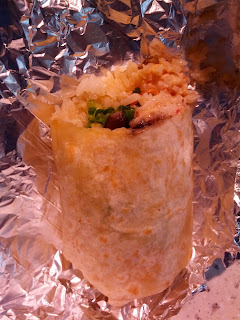 It was also my first time having a burrito at Rubio's, as I'm normally more of a taco girl. I liked my lobster burrito quite a bit, and after my last couple Rubio's experiences that were slightly disappointing, this helped me remember why I became such a fan in the first place. I'll be going back! Half a Langostino Lobster Burrito. Full size: $9.29. "Tender Langostino Lobster, our new citrus rice, fresh guacamole, black beans, chipotle white sauce, crisp lettuce and salsa fresca drizzled with warm basil butter then wrapped in a warm flour tortilla and garnished with a slice of lime." 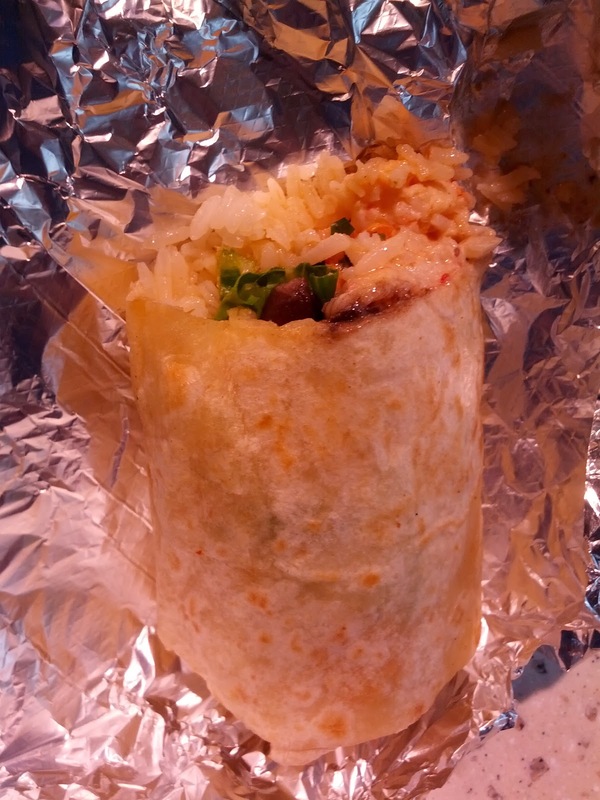 To start, I'm not normally a burrito person, since I don't tend to care for rice and beans. But ... this was a very tasty burrito! The flour tortilla was warm and fresh tasting. Not gummy, not soggy, good. The "new citrus rice" surprised me. Again, I'm not normally a rice fan, but this was fluffy, moist, and flavorful. It really didn't seem like it had been sitting around for ages. The black beans were as I expected, just not my thing. They were tender, well cooked, but I don't care for beans. I would normally ask to have these left out, but I wanted to try their full recipe to give it a chance (well, except I had to leave out the guacamole, since I'm allergic). The langostino lobster really surprised me. First, there was tons of it. Such a generous serving. The pieces were tender, seemed almost grilled? Slightly sweet, not fishy, good flavor and perfect texture, not too chewy. Much better than when I had it last year in the taco. The lettuce and salsa fresca were also very good. Both were incredibly fresh. The lettuce was indeed crisp, as described. How often does lettuce inside a burrito stay crisp? And the tomato was far, far better than any tomato I've had at a fast-casual restaurant (well, besides Rubio's!). It also had some corn. Amazingly fresh ingredients. The star for me was the chipotle white sauce. It had a bit of kick, and was really creamy. It went perfectly with the lobster and the salsa fresca. I didn't detect the warm basil butter as a distinct ingredient, but I'm guessing it was mostly mixed with the other sauce. The burrito was well constructed. Tightly wrapped, ingredients very evenly distributed throughout. Far better than pretty much any burrito shop I've been to. So, overall, I liked this. I probably wouldn't get the burrito again though, just because I'm not a huge fan of burritos. Or if I did, I'd leave out the beans. I'd certainly go for the taco, or, I think what I'd really like is just a salad, topped with the langostino, salsa fresca, and the delicious sauce as a dressing. This ranks up there as one of my favorite Rubio's dishes, and re-affirms why I first really started liking Rubio's: fresh, flavorful, and really well prepared. The price is $9.29 for a full size burrito, which is one of the most expensive items you can buy at Rubio's, but it is because of the very generous amount of langostino. I think the price is pretty justified. If you've read my blog for a while, you have probably heard me mention that I was on a medically necessary liquids-only diet for months a few years ago, and thus smoothies were a huge part of my life. 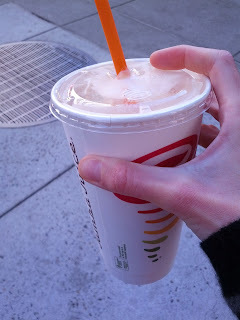 During that time, I had way more than my share of smoothies, including of course, Jamba Juice, which I've reviewed before. I was totally sick of smoothies, and have pretty much avoided them since. I sorta grew to hate them. After several weeks of consuming only liquids, it really doesn't matter how good a smoothie is, you just don't want another. Years later, and smoothies still aren't really appealing to me. But then I saw that Jamba juice offered a matcha green tea smoothie. I've been loving matcha lately, and it sounded more like a Peet's matcha freddo or a Starbuck's matcha frappuchino than a smoothie, listed in the "Creamy Treats" section of the menu, made with frozen yogurt and not any fruit or vegetables. So, even though I thought I'd never set foot inside a Jamba Juice again ... I did. The Jamba Juice near me allows for ordering through your phone via Paypal, so I made my order, and then walked the few blocks to pick it up. When I entered however, I was met with disappointment. Jamba Juice discontinued the matcha! (Although, outcry was so loud over this, that they are bringing it back ... soon). Since I'd already paid via the phone app, the worker said she'd make me whatever I wanted in its place. As I said, I don't like smoothies really. I didn't want a classic smoothie. I didn't really want anything. I sadly glanced over the menu, pausing at the rest of the milkshake-like "Creamy Treats" section of the menu. These are the ones that even Jamba Juice isn't trying to claim are healthy. They are made with frozen yogurt and more decadent ingredients. I've tried several of them before, and although I liked them more than the smoothies, I didn't find one that I really wanted to repeat. Having no real good choice, I went for the seasonal special, the pumpkin smash. I wasn't really sure if I'd like it or not, but, there wasn't anything I wanted more. It was good, but I still really want to try that matcha, when it makes its return! Pumpkin Smash. Original Size. $5.59. Since Jamba Juice didn't have the matcha, the friendly worker upgraded me from the 16 ounce size I ordered to the "original" size, aka, 24 ounces. It was massive! I honestly didn't think I'd even come close to finishing it, yet somehow ... I did. 107 grams of sugar later, I somewhat regretted that move. So. Much. Sugar. It was creamy, icy, well blended. Basically a milkshake. A very pumpkin-y milkshake. The spicing was present, but not all that strong. It was sweet, but not too sweet. It wasn't bad. It wasn't great. Would I go back for another? Probably not. But, if I found myself needing to pick a random Jamba Juice creation to get again, I'd consider it. At $5.59 for the gigantic size, it was priced right in line with all of their other drinks, but I still find them to be really expensive and not worth the price. For the fruit ones, I can somewhat understand, as fruit is expensive, but this was froyo, dairy base, and "pumpkin spice base", not exactly premium ingredients.